How long has it been since you and your spouse have gotten away for some well vested time in each other? Probably too long, right?!?! Well, several weeks ago for an extended weekend, I surprised the Mountain Man with a MUCH needed getaway – like 7 years much needed!! Even that weekend the words were spoken by the Mountain Man, “I really should have been home working on things because we had nice weather and the rains were coming”! We always find an excuse why we have to keep working and working and this weekend reassured me that the trick is to just schedule it and go or you will make excuses like we have! Prior to living off-grid one of our great escapes was on my 2003 Harley Davidson 883 Custom. She had flat bars, forward controls and was gun metal pearl. I had her for 9 1/2 years and she was the best therapy, freedom and open door to a close seat with God a girl could ever ask for! We have missed her, but this year we really really missed her and the freedom she gave us! We never actually had a honeymoon, we got married, had the trailers loaded and headed west and dove head first into building our homestead! I was thoroughly excited as well that I was able to make this trip. Missoula is three plus hours from us and after experiencing the health issues I did last year, my body is still healing, rebuilding and strengthening. The entire summer was hot and dry and the weekend that I decide to do this the weather changed. It was 49 degrees in Missoula and raining. My first hour and a half of my return trip was raining, but the remainder of my ride was sunny and warmed up! I was concerned that my body wasn’t strong enough for this trip, but I was able to make the return trip with the 2016 Heritage Softtail and completely surprise the Mountain Man. He is not too keen on surprises so I try to make my surprises good ones and ones that will show him that my surprises are safe! It was an exciting weekend all the way around! In my humble opinion I feel it is necessary sometimes to just walk away from it all – even if you can’t spend any money (honestly – we have gotten away several other times with a pack on our backs and hit the wilds for 3 or 4 days which is our normal way of escaping and something we truly LOVE), but I wanted to do something special for him, for us! Taking time for each other in this crazy world is something very important and will help build your relationship as well as strengthen it. 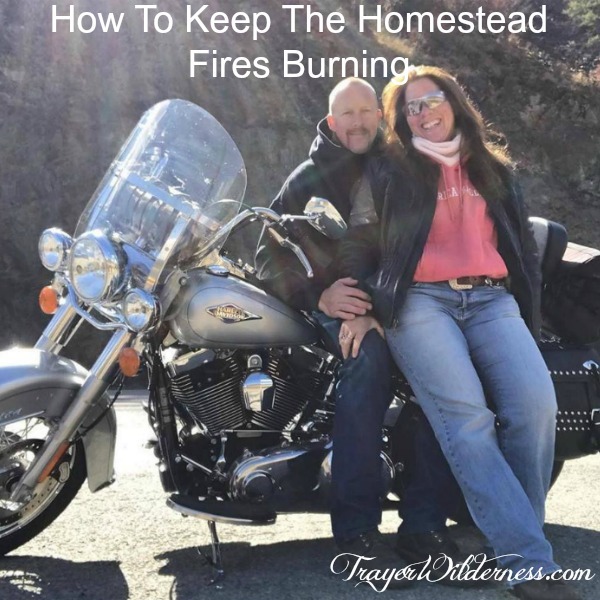 If you wish to keep the homestead fires burning throughout your entire marriage, you need to devote time, effort, patience and love. So many people say I do and get comfortable in the fact that you have each other and neglect to any longer put an effort forth in growing and building the marriage to new levels. Typically, both husband and wife have different interests. The Mountain Man and I are very similar minded, but we still have our differences. It is important to remember to do things that each other like and to put a spin on things and keep it interesting, not always doing the same thing over and over again (unless you are both creatures of habit). We enjoy variety and doing different things and many things for that matter so keeping things exciting and new is easy for us. If you and your spouse are stuck in a rut, I highly encourage listening to Joe McGee Ministries. His podcast is Fighting For Families Radio and his website can be found here. He is down to earth, extremely funny, insightful and honestly, it is education for the whole family. We use Joe McGee as a weekly family devotional time and the young men in the house have expressed that the knowledge learned about relationships is very priceless and useful in their future endeavors in finding a spouse. Our society has become very disposable and as soon as something breaks it is trashed and replaced and this has carried over to relationships as well. As soon as something goes wrong everyone is ready to end all. A marriage is not meant to be disposable and just like anything, when you put forth an effort the results are grand! One of the greatest securities in my marriage is that I know it is lifelong and that regardless if we have to walk in a valley at times, we are both committed to making it to the other side and to the brighter days! That comfort and security is a blessing in my life and something that I have never experienced before. It is powerful and I want to encourage others to have such a relationship. We allow God to lead the way in our marriage and in our lives and that is the equivalent of building your house on a strong foundation. We aren’t perfect and we make mistakes just like anyone else, but with a focus and commitment to one another like we have there is a bond and comfort that can’t be compared to anything else. When I mentioned getting time away with your spouse I didn’t mean sitting at a restaurant table each with your iJigger (Mountain Man’s name for a smartphone) and Facebooking or messaging with friends! Time spent with your spouse should be when you are both being very attentive to each other, talking and more importantly listening. The day to day life can be busy and tiring and it is important to remember how to date and keep those fires burning! If your finances are tight like ours you may just need to be creative! Put the kids to bed early one night, feed the kids and let them have a movie night and you and your spouse enjoy a nice quiet dinner together and if you do have a sitter find something inexpensive to get out a do. Go for a walk or hike, we like to antique or thrift, snuggle by a fire, if you are sports oriented go for a bike ride, etc, play a board, card or dice game and lastly watch a movie together. Movies are great and honestly, I love to decompress in front of a movie because I don’t need to think and I can just veg, but when it comes to spending quality time with my man I want to find something to do that we can talk and laugh together. Something else we do together is spend time doing our devotions. There is something very powerful to have a strong, handsome man that fears God! It may have taken us seven years to do a bigger getaway, but we invest time in our marriage weekly and I encourage you to do the same! Hold your date nights as a sacred night and don’t let anything interfere with that important time! As with everything we do here on our homestead, if you need an ear or have questions, please don’t hesitate to reach out by emailing us! We want to help people build their homesteads and help people embrace an off-grid lifestyle, but the foundation needs to be strong and kept strong and that is your marriage! If your marriage is weak as will your homestead be weak! So please remember to invest the time necessary in your marriage to keep those homestead fires burning!